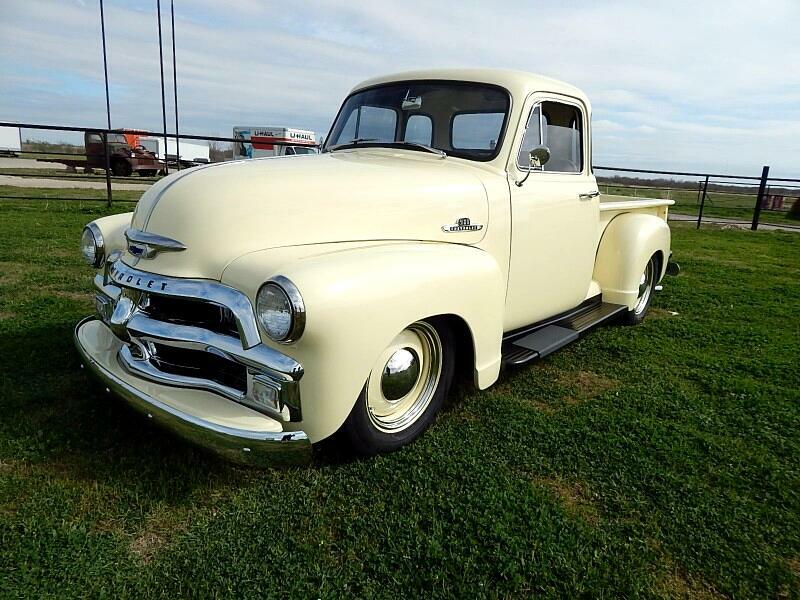 Lone Star Muscle Cars is Proud to present this one of a kind early 55 Chevrolet 3100 Custom Resto Mod. This is a show quality high end build. Lets work our way from the ground up. Roadster Shop Stage Three Chassis, Superide Independent Front Suspension, Power Rack & Pinion, Drop Spindles, 11" polished Wilwood calipers Front and Rear Disc Brakes, 10Gauge Fully Boxed Frame Rails, Triangulated 4-bar coil over Rear Suspension, Ford Nine Inch 28 Spline axles with 3:42 gears and Front And Rear Sway Bars That Is Just Ont The Bottom Side. To Power This Classic Truck Down The Highway Powered By The All Famous LS-2 402 CI From SLP industries. This is a New Crate Motor with a 4L60 Automatic Transmission Four Speed Over Drive. With Aluminum Drive Shaft, Stainless Steel Fuel Tank Relocated under the Bed With Side Drivers Side Fill. Wizard Aluminum Radiator, 17X7 Gennie MU wheels with Cooper Tires. To Stop This Beast is the Hydratech Hydraboost Brake system. When You cruise This Truck Here Are Some Of The Creature Comforts Like Gen Four Vintage Air System, Rostra DBC Cruise Control System, LaCarra Steering Wheel Connected to a I-Did-It Steering Column, Classic Instrument Gauges, Retro Sound Sound System with ipod compatible, Pioneer Amp, Infinity Kappa Speakers 2-4",2-6"x9", Brown Alante Custom Bench Seat, Lokar Pedals. The truck was rewired with American Autowire Wiring Harness. This Was A Frame Off Nut And Bolt Restoration And It IS ready for the Show Or The Road. If you are looking for that special truck here it is. This is a high Quality Build and ready for a new home. Message: Thought you might be interested in this 1955 Chevrolet Trucks Pickup.